For the last 5 months I have been working on a movie. My first movie. And it’s been a hell of an adventure. You will think: “ok, it’s probably a 3D animated movie, and you have been involved with Lighting, or Lookdev, or at least, as a 3D Generalist. And being Spanish, it has probably been in Madrid or Barcelona”. Well, the answers are no, no, and no. 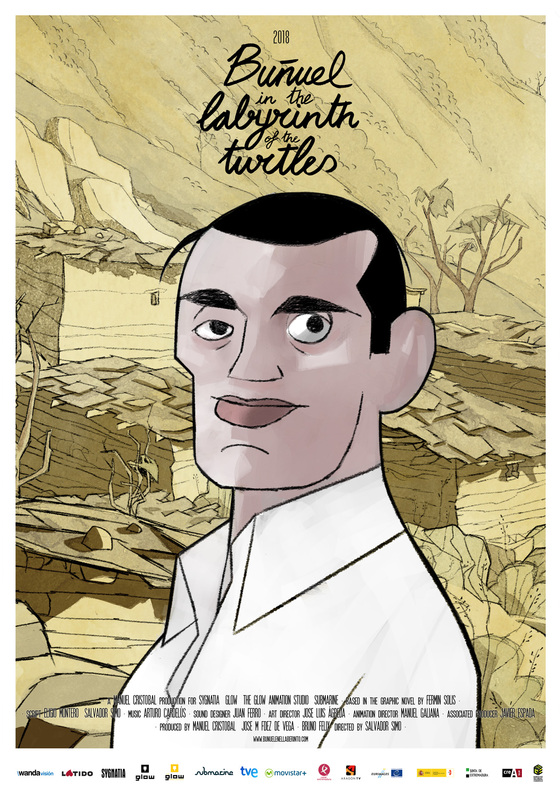 The movie is called “Buñuel in the Labyrinth of the Turtles”, and it’s a 2D animated movie about the famous director Luis Buñuel and the shooting of his documentary “Las Hurdes: Land without Bread” (1933). It’s currently under development by Glow Animation Studio in Almendralejo. A small city in Extremadura, very similar to my own, and just 1 hour from my home. The least expected place you’d think of. But hey, if you think of quality of life, it’s a great place to live in (except for extreme temperatures in summer, which I can’t stand). It’s quiet, but there are plenty of things to do. It’s small, so you can go walking almost everywhere. It seems to be in the middle of nowhere, but instead, it’s just 1 hour from bigger and more known cities such as Cáceres and Badajoz, and barely 20 minutes from Mérida (touristic cities with plenty of great Roman ruins and Medieval places to visit, many of them used in Game of Thrones). And most of all, it’s alive: lots of cultural activities, terraces, parks…..
And what did I do?. I’m afraid I can’t say much about it until the movie is released. Only that my charge was “Layout TD”, and it wasn’t related to the kind of job I’ve been doing for the last 14 years. Getting out of my comfort zone has been a great experience, I think I’ve learnt a lot, and I’ve met a bunch of great artists that have become good friends. Being one of the only two “3D guys” -along with my supervisor-, and coming from another completely different field, I’ve felt like a fish out of water, but having such a great team has made this adventure easier and fun. Even hard times (there were a few) were less hard with them by my side. So I’d like to thank them all for…..everything. I don’t want to forget anybody, so I won’t mention their names. They know who they are. I hope to see you on “Buñuel 2: the Revenge of Ramón” !! !